Where did the inspiration for The O’Rourke series come from? We like all of the old time murder mysteries like Thin Man, Charlie Chan, Sherlock Holmes, Miss Marple, Hercule Poirot, and the list goes on. We decided to give a tip of the hat to these old school detectives while including the latest in technology. Is it difficult to write a book together? Do you run into arguments over plot or character? Neither one of us finds it difficult to write together. We do disagree on plot and perhaps character motivation at times, but we find that talking it through stimulates both of our imaginations. Eventually we find a mutual common ground. Is mystery/crime your favorite genre to write in? While we enjoy the mystery crime genre, we currently have a non-fiction paranormal book in the works, a historical fiction book coming down the pike and a children’s story book series coming soon. Will there be a fourth book to The O’Rourke series? 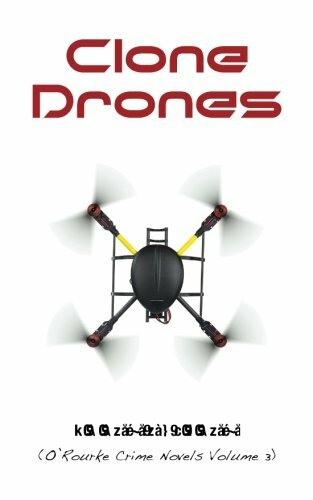 What inspired you to write about drones in the third book of the series, Clone Drones? It was evident when we began to write the book that personal drones were bursting upon the scene. We knew that it was only a matter of time until an enterprising criminal weaponized them. Of course, now many people own and operate personal drones. Recently a young man did indeed weaponize his drone. The FAA is currently investigating this issue along with ways to regulate and police drone traffic. Do you think drones will ultimately positively or negatively affect us in the future? Which book of the series so far is your favorite and why? Clone Drones is our favorite because of the action, continued growth of the characters and the relevant storyline. So far Clone Drones has won two awards and it’s gratifying to have other people recognize its merit. RC and JP Carter are the award winning authors of The O’Rourke Series. They also love paranormal investigating, bicycling, camping and travel. It seems there are stories everywhere!